So I thought I would get both of my multi-effect pedals out of the way. Everything generic I said about the Zoom applies to this pedal as well. Like the Zoom, the BP80 is made of plastic, so I wouldn't use it as a door stop or close combat weapon. The "expression pedal" portion (their term, not mine) is about the size of my 5-year-old daughter's foot, so you need to allow yourself space around it if you tend to use it and don't have freakishly small feet. It is about as easy as the Zoom to program, but they cram almost 100 options under some channels, and the only way to scroll through them is one at a time. That can get annoying and tedious. 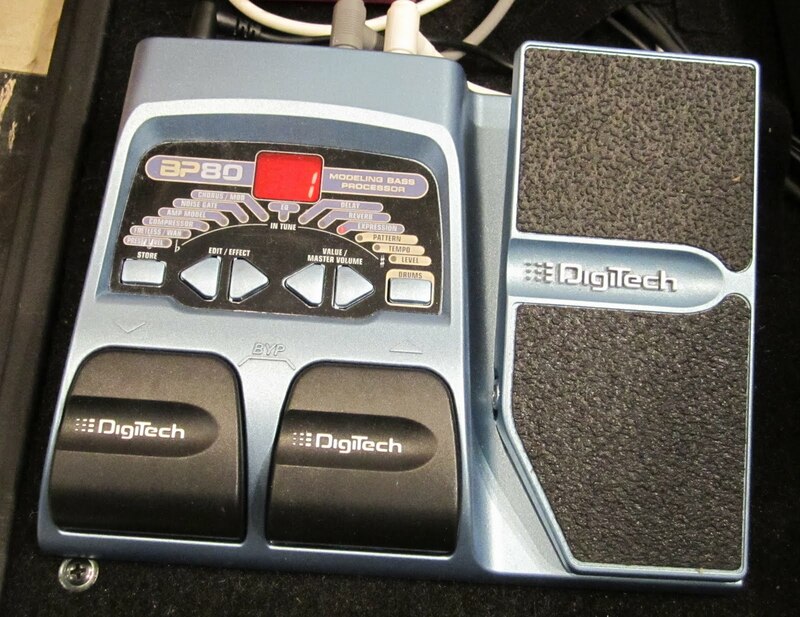 It has your standard tuner/bypass feature and runs on a 9v or AC adapter. It also has a headphone jack, which is kind of cool if you are looking for a way to practice quietly and don't have a headphone jack in your amp. New ones run about $65 shipped from eBay, but used ones are considerably less. The BP80 has 80 program slots. The first 40 have factory defaults but can be erased/altered by the user. Program slots 41-80 have the same factory defaults as the first 40, but can't be messed with. It also has cabinet modeling and a built in drum machine, neither of which I have ever used. If you like making freaky sounds with your bass, there is a lot of potential here, especially for things like chorus, flanger and phaser where you can actually manipulate the effect and not just the output level. I'm sure there are other more expensive multi-effects for bass that can serve this type of purpose, but I don't have those. I like both of my multi-effects for different reasons, and I'll probably keep them on my pedalboard as long as I have space. I've got this toy long time ago (used). I think I bought it because it was really cheap. Is it possible to use just the compressor in one of the slots?